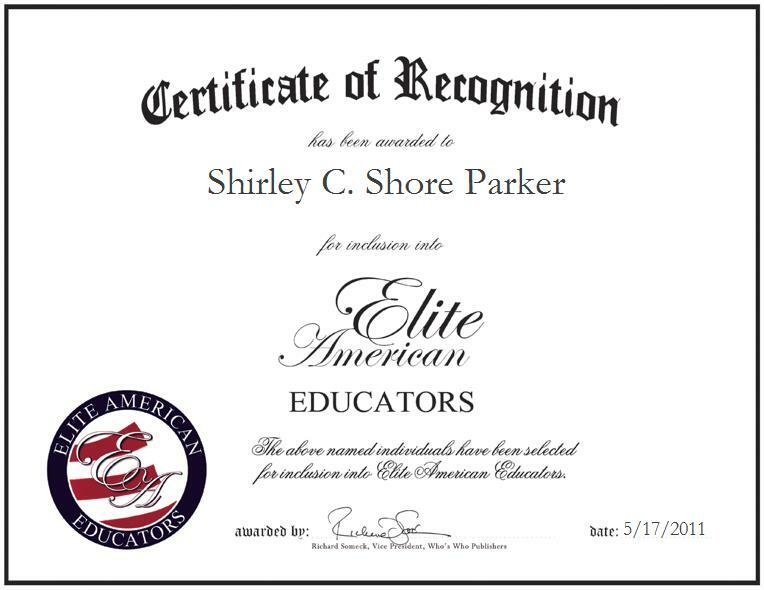 Carrollton, TX, May 17, 2011, Shirley Shore Parker, Retired Teacher at Carrollton-Farmers Branch Independent School District, has been recognized by Elite American Educators for dedication, achievements and leadership in elementary education. Influenced by her father and role model, Ms. Shore Parker acted on her desire to help shape communities and society by educating elementary school students. She attended Texas Womens University, where she earned a bachelor’s degree in elementary education and music, before completing a master’s degree in supervision and art education at North Texas University. She also obtained a teaching position within the Carrollton-Farmers Branch Independent School District, which she held for 20 years. During her tenure in the district, Ms. Shore Parker focused the most on students with special education needs. She found that she held a special affinity with those students who had learning disabilities, developmental disorders or the children of new immigrants to the U.S. She devoted her time and attention to these students to working with them through their educational lessons, as well as life skills. Although she has since retired from teaching in the public school system, Ms. Shore Parker has continued to maintain her love for teaching Bible studies classes. For the past 20 years, she has been a teacher with Winnsboro Church of Christ. Previously, she taught in Dallas, Texas.